Everything you hear about Marineland and its owner, John Holer, just gets more and more bizarre. And horrific. Why is this place still operating? Why is this man even allowed to be within a mile of any animals anywhere? 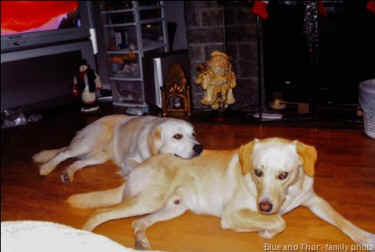 The latest, from the ever-investigative Toronto Star, is the story of how, two years ago, two family dogs (both Lab mixes) got out of their backyard near the Marineland zoo and sea circus at Niagara Falls, and were spotted near the red deer pen. John Hammond, at that time the zoo's land animal supervisor, says he asked Holer if he should call the local shelter. Holer replied: "No, we don’t want to call them. I’ll look after it." Holer told him “to check if there were any collars . . . around their necks and if there were, to remove them.” Hammond doesn’t remember seeing any collars. When the Star called Holer about the dogs, he "either hung up or stayed on the line, breathing without speaking." So the newspaper e-mailed him and got a response from the zoo's attorney, saying: "The three-year-old false and defamatory allegations named by an unnamed person(s), are grossly inaccurate and false and are part of an unfair public vendetta against Marineland by animal rights activists who seek to shut all zoos and aquariums in Ontario, aided, supported and furthered by you, despite the clear and unequivocal finding by qualified veterinary experts that there is ‘no evidence of animal abuse’ at Marineland." Not quite the same thing as saying that Holer didn't shoot the dogs. So, why is this man still walking around? The Niagara Falls Regional Police told the Star the allegations were "unsubstantiated." A neighbor says she saw the shooting and called the police, but the dispatcher told her that Holer "had the right to use a gun on his property because it was agricultural" and that "it would take quite a while for the police to come . . . it just didn’t seem like a priority to them . . . they just kind of shoved it under the carpet." The humane society declined to talk to the Star. The family of a boy whose friend had told him he'd seen the shooting declined to discuss it. And the police have nothing further to say. Hammond says he feels "overwhelming guilt" over what happened. Meanwhile, almost every week there's a new horror story about Marineland. Holer is currently suing former staffers who have told the press about the appalling treatment of the animals. But the Canadian Association of Zoos and Aquariums (the trade association for these commercial operations) has given Marineland a clean bill of health after a series of investigative reports by the Star last year finally forced them to make a show of conducting inspections. How long will it take before this chamber of horrors can be shut down? The Star promises to stay on the story – even if the government, the police, the zoo association and even the humane society all turn the other way.